Standing seam metal roofs are ideal for additions, porches, and bay windows, as well as whole house installation. Interested in installing a metal roof on your home? 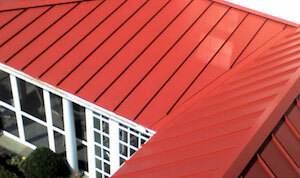 There are many types to choose from, but standing seam metal roofing is one of the most iconic. Available in a variety of colors and able to work with many different kinds of roofs, it's no question that standing seam roofs have attained ever-increasing popularity. If you are looking for a standing seam metal roof for your home or business, Global Home Improvement has the perfect style for you. Whether you are interested in architectural or structural metal roofing, we can provide you with the information to make an informed and beautifully long-lasting choice to top your building. Global Home Improvement serves the metal roofing needs of customers in Doylestown, Ardmore, Cherry Hill and throughout the surrounding areas. Schedule your free estimate for standing seam metal roofs today! Architectural metal roofing is generally for looks and water shedding, and is not meant to carry heavy weight. In fact, the roofing needs a deck below for support. Otherwise, this type of roof will not be able to withstand the wind. Architectural metal roofing is not necessarily watertight, but the panels are designed to shed water. In order to do so, the roof has to have a certain pitch. Architectural metal roofing is not suitable for flat roofs or certain climates. When choosing your roof, you must consider the proximity to the ocean, the geographic location, and the building itself. However, when it is the right roof, you will also have a variety of colors to select from for the perfect look. Structural roofing works great in areas accustomed to high winds with open framing constructions. This system is also designed to keep your structure watertight. Although the roof slope does not have to be as steep as the architectural design, your home still needs a little slope to make sure the elements do not batter the home, but instead run off. As with all our roofing materials, standing seam metal roofs come in many colors. Ready to install standing seam metal roofing on your home, or need more help deciding which roof will work best for you? Global Home Improvement is your local roofing expert ready to assist in all of your roof replacement needs in PA, NJ & DE. Schedule your free estimate today!